If you own ATVs, you are more than welcome to bring them. We have hundreds of miles of trails, animal paths, streams and old logging roads where you can explore the wilderness for hours. If you come to Foleyet for fishing or hunting, you can use your ATV to access remote lakes that people never fish or use your ATV to conveniently access some of our more remote hunting areas. ATVs are also convenient for animal retrieval. 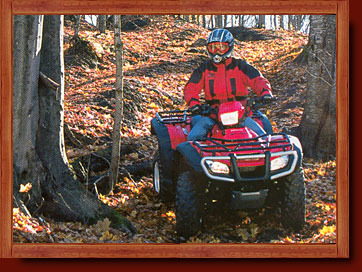 All we ask is your ATV has a well performing muffler and the vehicle is not leaking any fluids. Please contact us for more detailed information.